Gary Stephen "Angry" Anderson AM (born 5 August 1947) is an Australian rock singer-songwriter, television presenter-reporter and actor. He has been the lead vocalist with the hard rock band Rose Tattoo since 1976. On Australia Day (26 January) 1993, Anderson was made a Member of the Order of Australia for his role as a youth advocate. According to rock music historian, Ian McFarlane, "over the course of a lengthy career, [the] gravel-throated vocalist ... has gone from attention-grabbing, rock’n’roll bad boy to all-round Australian media star." 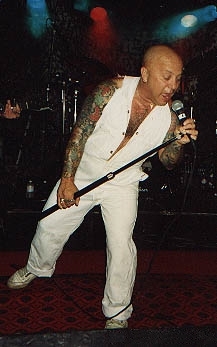 On 16 August 2006, Rose Tattoo were inducted into the Australian Recording Industry Association (ARIA) Hall of Fame.